Although first dismissed by some older veterans, soldiers in World War II eventually warmed up to the Lee-Enfield Rifle and came to appreciate its benefits. By 1901, the Small Arms Committee—the body within the War Office tasked with arming the British Army with weapons—sought to replace their then-standard issue rifle: the Magazine Lee-Metford Rifle Mark II. The Lee-Metford, which had come in to general service in 1893, had had its issues from the start. There were significant cost concerns because two different models—carbines and rifles—had to be manufactured. The gun also had problems with barrel wear that resulted in poor accuracy, and ammunition was difficult to load due to awkward magazine access. Finally, its length, weight and bayonet fitting caused trouble handling the piece. Between 1902 and 1906, after numerous modifications and experimental trials, a new bolt action rifle—the Short, Magazine Lee-Enfield Rifle Number 1 Mark III (SMLE No. 1 MK III)—was adopted by the British armed forces in 1907. The new rifle incorporated a host of modifications not found on the Lee-Metford. These included a fully enclosed top hand-guard along the barrel, and a rear sight that graduated from 200 to 2,000 yards. (In later models this was increased to 2,800 yards). Most significantly, the weapon’s barrel length and total weight—25.2 inches and 8.8 pounds, respectively—were five inches shorter and 1.4 pounds lighter than the Lee-Metford. Charger loading guides to allow faster loading of its five round clips were also added to the new rifle. The 17-inch long Pattern 1907 Sword Bayonet was fitted to the rifle, and in that year the SMLE became the standard small arms for all services in the British Empire’s armed forces. (Note: the nomenclature “Short” in SMLE refers to the rifle’s shortened barrel, not its shortened magazine. This short barrel trait would be deemed so important that by the start of World War II, all major military powers came to make short barrel rifles the standard shoulder arm in their arsenals). In 1911, a new cartridge was introduced which became the standard ammunition for the Lee-Enfield Rifle for the rest of its service life. This was the “Cartridge, S.A., Ball, Mk VII, C” a cordite load which had a pointed, or, spritzer, bullet. This .303 round, weighing 174 grains, delivered great range ( accurate at 2,000 yards) and possessed tremendous penetration power since its velocity was 2,750 feet per second allowing it to punch through at 200 yards 38 inches of hardwood, 58 inches of softwood, 14 inches of lime-mortared brickwork,18 inches of packed sandbags, or 60 inches of clay-packed sandbags. This ammunition fitted in to a ten round magazine using five round charger clips. The iconic British Army rifle of World War I, over 3,850, 000 SMLEs were produced during the four years of that conflict. Some were converted to meet the unexpected challenges of trench warfare. Almost 10,000 were modified as sniper rifles, and like the other models used, without outstanding results. Lee-Enfield rifles were refashioned to serve as barb-wire cutters, first latching on to the offending wire and then severing it with a fired bullet. Other SMLEs were modified to shoot the Number 36 MK I Mills Grenade fitted to the rifle with a cup discharger. This explosive could be fired up to 200 yards and proved so efficient that the partnership of the SMLE and Mills grenade continued to be employed throughout World War II. Pleased with its performance during the Great War, the SMLE—with minor improvements such as an aperture rear sight, a thickened gun barrel, and a new bolt-release catch—was approved for service in November 1939. Designated as Rifle Number 4 Mark I, 4, 244,700 were produced during the Second World War by British, Canadian and United States factories. With demand high, the Number 4 did not reach the armed forces until the second half of 1942. The basic design was so good that only minor modifications implemented in mid-1941—adopting a two-groove barrel instead of the normal five or six groove barrel—were ever made. 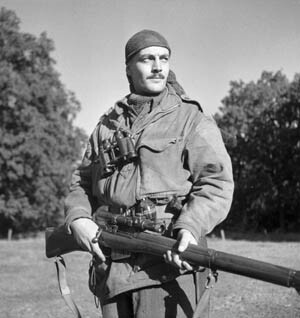 The revised Number 4 Mark 1* remained England’s frontline service rifle in conjunction with large numbers of Number 1 Mark IIIs, the latter of which were used in theaters outside of Europe. Tens of thousands of Number 4s were dropped in to the nations occupied by the Germans and used by resistance forces. As the war progressed, the Number 4 Mark 1 was modified to serve as a jungle carbine, and a sniper rifle. In an environment where ambush and dealing with tree-posted snipers required a quick response and a high rate of return fire, the standard bolt-action Lee-Enfield Number 4 Mark 1 Rifle could not do the job. To remedy the situation, the British armed forces introduced a modified SMLE- the Rifle 5 Mark 1, with a barrel five inches shorter than the normal Number 4. Unfortunately, its shorter barrel caused serious accuracy problems. It was also plagued by a tooth jarring recoil and was slow to shoot. These characteristics made the weapon very unpopular with the troops, even though its shorter barrel and lighter weight made it suitable for close quarter combat in the jungles of the Far East where the gun was exclusively employed. On the positive side, the Number 5 Carbine proved very efficient as a grenade launcher. Another variant of the Number 4 Mark 1 was the sniper version, which went in to full production in late 1942. Fitted with a Pattern Number 32 telescope, this rifle—designated the Number 4 (T) Sniping Rifle—proved to be an excellent sniping tool, and was used in every battle zone of World War II with more than 24,400 produced. 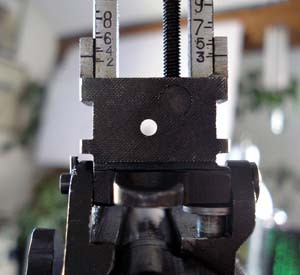 When the Number 4 Mark 1 finally reached the line regiments during World War II, the men found using it very frustrating, mainly due to its complex sights. Many, especially the “old soldiers”, wanted to fight with the out- dated but still reliable World War I SMLEs. However, as the conflict progressed the men came to appreciate the new rifle’s advantages: handiness, light weight, and the ease and rapidity which it could be pointed and aimed. The only persistent complaint regarding the Number 4 Mark 1, which ran the entire course of the war in Europe, was the difficulty in keeping it functioning in the field due to the abundance of rainfall. The incessant moisture caused frequent rusting of the bolt and barrel requiring daily cleaning and oiling of those rifle parts. After performing yeomen service in the Second World War, the venerable bolt-action 4 Mark 1 soldiered on in the British Army until being retired from service in 1957, replaced by the Belgium made semi-automatic FAL (Light Automatic Rifle). Tags Allies, armed forces, Axis, Belgium, British, British Army, British Empire, Canadian, carbine, CIA, England, Europe, general, German, Lee-Enfield rifle, Lee-Metford Rifle, Mark I, Mark III, military, Mortar, OSS, POW, Rifle Number 4 Mark I, Sniper, sword, Tern, Trench Warfare, United States, war in europe, weapons, WIN, World War I.
I purchased a 1943 British Enfield at a gun show some 30+ years ago.It is a remarkable weapon with great accuracy. It also has a military sling. It has great range and very easy to handle. I had to smile at the remark ‘light weight’ of the Lee-Enfield 303. My mate Reg, 5’2″ had his tank knocked out in France and had to make his way to Dunkirk. Given a LE303 to carry he made his way through to Dunkirk where he had to climb through broken windows and gutted buildings under bombardment and shelling. Exhausted he had to de-commission his rifle and leave it as he didn’t have the strength to carry it any farther. He only just made it out being one of the last to be evacuated.